Even though I no longer choose nonfiction books for the library, I love to browse the New Nonfiction on the first floor of the Central Library of CCLD. There are so many good books on so many subjects, but I still tend to grab biographies or personal narratives; I grabbed three fascinating ones last month. 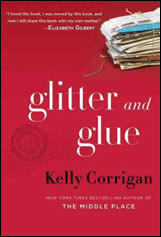 The first one was Glitter and Glue by Kelly Corrigan, which on the surface is about a woman who graduates from college and wants life to be an adventure; after she works for a year to save money, she and a friend take off for New Zealand , Thailand, and Australia, where she runs out of money and takes a job as a nanny. She writes really well and this appears to be a light, quick, fun read, but when you get to the end, you realize it is really about relationships, specifically between mothers and daughters and how it changes over time and experience. I so wanted to talk about the ideas in this book; I wished I belonged to a book club so I would be able to talk about it with others who had also read it. The next one I read was One Doctor: close calls, cold cases and the mysteries of medicine by Brendan Reilly. It always amazes me how well some doctors write! I read anything by doctors Jerome Groopman or Atul Gawande and now I have a third doctor who illuminates life choices we all make. Drawing us in like the best medical shows on TV by describing his patients, he shows us how doctors make life and death decisions every day. The third one I read was This is the Story of a Happy Marriage by Ann Patchett. The well-known writer of fiction writes not a straight biography but each chapter is an essay formerly written for a magazine or newspaper about some aspect of her life; she writes about her devotion to writing and gives advice to wanna-be-writers, she writes about caring for her dog, her grandmother and a nun who was her teacher in grade school. Her honesty and nuanced essays will make you consider what she says long after you have finished the book. Although all of these books were about someone’s experiences, only one was in the biographies. Glitter can be found under call #910.4 COR and One Doctor can be found in #610. 69 REI. Enjoy! 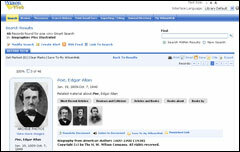 Wilson Biographies Plus Illustrated is a useful tool for beginning biographic research. This database, accessible to CCLD patrons from our website, provides full-text profiles of many famous people throughout history (including prominent individuals from today). A profile includes images as well as links to recent articles about the individual (some full-text articles are available). Additional information is often available including: awards, reviews and criticisms, and books by and about the individual. To access this database, visit our website’s electronic databases section (located under “Reference”) and click on the link for “Wilson Biographies Plus Illustrated”. Be prepared to enter your library card number to access this tool.